When you have no estate plan, life changes could lead to personal and financial disaster. Future planning is all about planning now to save time, trouble, stress, and money in the future. If you are on the fence about creating an estate plan, learning about the worst case scenarios may change your mind. People who have not made an estate plan usually have not signed medical directives or powers of attorney. These documents allow a person you choose to make decisions on your behalf if you are unable to make decisions for yourself. Medical directives can also specify end-of-life care procedures and permit your representative to speak with medical professionals on your behalf. Without them, your doctors may not be able to share important information about your care with the person of your choice. Powers of attorney can help keep your business or personal life going even if you cannot make it to the bank or sign legal documents. For people who are not married but have a significant other, people with blended families, or people caring for adult children or non-relatives, directives and powers of attorney are even more crucial. They demonstrate that you have a legal right to act for a person even if you have a different last name. Future planning is not just signing documents. Appropriately directing your money, or that of family members, toward the care of a person with special needs or your own care takes careful consideration. You will want to investigate how to use a combination of money stored in a trust, government benefits, and other resources for future support. The more money you save now, the more you will have in the future if you invest it wisely. For most families of individuals with special needs, it is crucial that a special needs trust be established as a place for the parents and other family members to leave hard earned savings to benefit the individual with special needs without the loss of essential government benefits. Future planning does not end after you sign the documents and begin saving money. Your estate plan should change when your life changes. If you divorce, marry, have a new child, lose a family member, change jobs, or experience other personal events, take a look back at your future plan afterward. 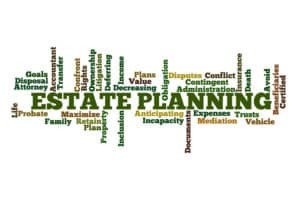 People with outdated estate plans may not have their wishes carried out if they become incapacitated or may learn that their families are not as well-protected as they thought.